When he was a little boy, Anthony Lickteig-Carter would see airplanes in the sky and dream of flying them one day. After experiencing a life-threatening illness during childhood, the Make-A-Wish foundation stepped in and helped him become a pilot for a day. 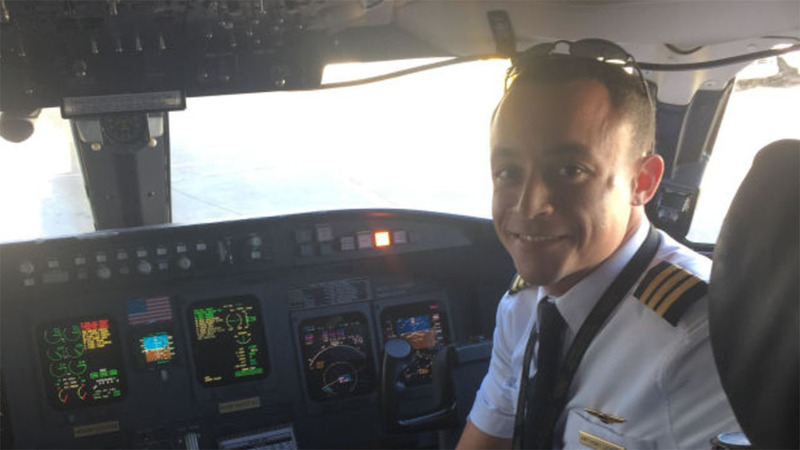 Now 15 years later, Anthony is living out his dream of flying as a commercial airline pilot. Anthony was born with gastroschisis, a birth defect that caused his stomach to be outside of his body. The first 10 years of his life involved many surgeries, weekly trips to the doctor, countless lab tests, and lots of missed school. With the love and support of his family and friends, Anthony was able to find some normalcy amidst the hardships. He often visited Post Road, an area by the airport to watch the nearby planes land. Anthony credits these airport visits to helping him cope with his illness. "Even though there was a lot of uncertainty and change back then, the only constant variable was my love for flying. It got me through all of it," he tells Babble. "I truly was on top of the world. It gave me that much more reason and determination to fly for a living. I didn't know how I was going to, but I knew I was." By age 10, Anthony's illness had healed and he was determined to make his dream a reality. After studying flight training at St. Cloud State University, Anthony applied to any flying job he could, slowly building the experience necessary for an interview with SkyWest Airlines, his dream airline. "The interview was one of the most difficult in the industry, and I knew if I could do that, I can do anything," Anthony shares. Today, Anthony is a commercial airline pilot for SkyWest. The coolest part? He regularly flies over Post Road, and sometimes spots other children watching. "That gives me goosebumps still!" Anthony says. For this Make-A-Wish recipient, being a pilot is more than just a dream come true - it's his life's purpose. Anthony feels humbled to go to work each day. "I still get that smile on my face stepping into the flight deck everyday like I did as a little kid," he explains. Anthony hopes his story will inspire families struggling with childhood illness to remain strong, even during the darkest days. "Find that strength that I know you have. For me it was flying, but it could be anything. Find that something that is worth fighting for, and let that be your rock and motivation," Anthony suggests. As for the future? Anthony can't wait to upgrade to Captain in 10 months, and he's even more excited to transition to flying bigger airplanes in the coming years. He also wants to create a non-profit organization to help expose kids dealing with illness, and other adversities, to their true passions. Anthony feels grateful for how positive his own life has turned out, and wants to share that feeling with others. "I'm am a healthy adult, and I give thanks each day for that. Without the many doctors, surgeons, family, and friends who have helped me over the years, things could have had a completely different outcome," Anthony says. When Make-A-Wish shared Anthony's story on Facebook, which has received 18K likes and 1K shares, they included a hopeful reminder to parents everywhere. They shared, "We don't grant wishes for short-term smiles. We grant wishes to positively impact long-term health results." It is the organization's belief that the real purpose of a wish is to help kids believe in their ability to live with or even overcome their illnesses. In the case of Anthony, that belief helped him realize a lifelong dream in the process. Anthony is an incredible reminder of what it truly means to hold onto your dreams, no matter how big the obstacles. Go Anthony!